Winter is coming! Fresh snow has fallen on most of the GDT. Expect snow at higher elevations with wet, icy and slippery trail conditions, and wet and muddy sections at lower elevations with recent rainfall or snow melt. Nighttime and morning temperatures are below freezing, and significant snow is accumulating at higher elevations. Be prepared for early winter weather conditions when travelling into the backcountry this fall. Jasper National Park: The GDT is closed from Four Point Campground to Signal Mountain Trailhead from November 1, 2016 to February 28, 2017, to prevent trails from facilitating an unnatural level of predator access to threatened woodland caribou. Peter Lougheed Visitor Information Centre is under a seasonal closure from October 11 until November 17, 2016. 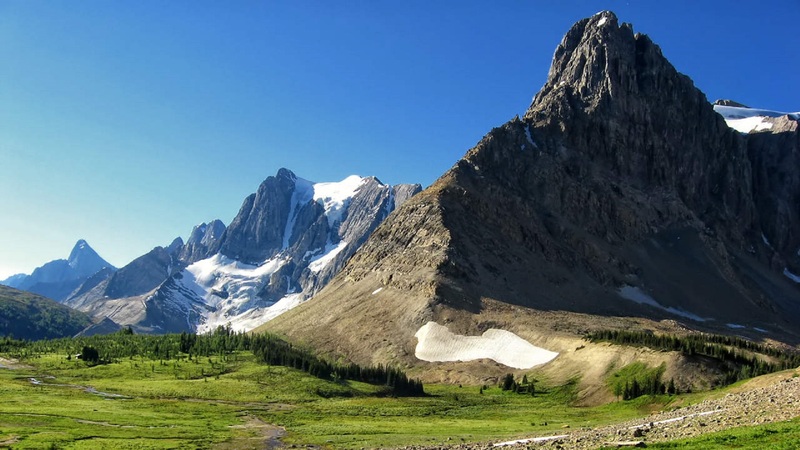 Jasper National Park – Two grizzly bears are frequenting the area between Nigel Pass and Maligne Pass. The bears have broken into cabins along the South Boundary trail to access horse feed. While they are no longer appearing at the cabins and have not shown aggression to people, they may return to the area. Pay extra attention when hiking in the area, make noise, and carry bear spray. Early winter conditions exist so be prepared and pack accordingly. Snowshoes or cleats/spikes, and poles are recommended. The damaged Lambe Creek bridge (d10) was removed in September 2015. It is recommended to ford the creek farther downstream and cross early in the morning when glacial melt is lowest. The trail from Pinto Pass (e5) to Pinto Lake (e6) was cleared and blazed in August 2016. A new toilet and bear hang were installed at the Pinto Lake North (main) campground. The trail from Colonel Pass (f9) to Upright Creek (f12) was cleared and blazed in August 2016. The trail has been moved back to the east side of the Moose River between Colonel Creek and Upright Creek and the ford of Upright Creek is marked. Colonel Creek campground (f11) has been restored. The bridges across Gendarme and Carcajou creeks are out on the Jasper North Boundary Trail. These two creeks are smaller than the Smoky River, but can still be treacherous. Cross Gendarme at the horse crossing just below the old bridge. Carcajou can be forded where the trail crosses the creek, unless the water level is high, then cross about 100m below the trail. The trail north of Jackpine Pass (f21) all the way to Kakwa Pass (f42), is not marked and frequently disappears in meadows and boggy river valleys. Follow the GPS track to stay on route. The bridge across Buchanan Creek, near the Kakwa Lake trailhead, has been removed. The crossing here can be hazardous early in the year or after heavy rains. In 2015, a gravel bar about 50 metres across the creek upstream provided the best crossing. The 10 km of road from Buchanan Creek to Bastille Creek is closed to vehicles as it is no longer driveable due to washouts so be prepared to walk this distance on foot. Kootenay National Park – Numa Creek Trail remains closed due to a washed out bridge. Access to the northern terminus of the GDT in Kakwa Provincial Park is via the Walker Creek Forest Service Road. The Walker Creek FSR has been repaired from Highway 16 to km 33.5. While travelling the remaining 40 kilometres on the Walker Creek FSR, attention is required to navigate the surface as it is uneven, rutted and slippery. The road is not recommended for anything other than a 4×4 high clearance vehicle. The last 10 km from Bastille Creek to Buchanan Creek is closed due to washouts and is not driveable by vehicle so be prepared to walk this distance on foot. Oh The Peaks You Will See: New Trail, New Peaks!